Dorothy Garlock (1919-2018), the best-selling American author of romantic novels, used Lake Chapala as a setting for parts of Amber-eyed Man, first published in 1982. Garlock, who also used the pen names Johanna Phillips, Dorothy Phillips and Dorothy Glenn, wrote more than 50 novels in total. She was born in Grand Saline, Texas, on 22 June 1919 and died in Clear Lake, Iowa, on 6 April 2018. It is unclear how much personal knowledge the author had of Chapala but she had the reputation throughout her writing career of being a meticulous fact checker. Subsequently it emerges that “the estate there at Chapala was a lettuce ranch that employed a large number of people.” This sounds like pure invention; I have never come across any other reference to a lettuce farm in the Lake Chapala area, certainly not one large enough to employ a large number of workers. Returning to the novel, Ward was immensely wealthy and “divided his time between the Rancho de Margarieta (sic! ), the lettuce ranch at Chapala, Tulsa, and the plant in Guadalajara.” The latter is an electronics plant. Bearing in mind that the book was written in 1982, this signaled the start of the Guadalajara region’s reputation as Mexico’s Silicon Valley. In combination with a second novel – The Planting Season (1984) – Amber-eyed Man was reprinted in 2008 as Promisegivers. Garlock’s books were incredibly popular. Translated into 18 languages, she sold an estimated 20 million print copies in total. Seven of her books made the New York Times best seller list and Garlock was named one of the ten most popular writers of women’s fiction for four consecutive years from 1985 to 1988. Like Barbara Bickmore, Garlock did not set out to have a writing career at a young age. She worked as a reporter and bookkeeper for the Clear Lake Mirror Reporter for 14 years and only began her writing career when she and her husband traveled to the southern U.S. in 1976 to escape the northern winter. She later recalled that she became so bored on the trip that she bought a second-hand manual typewriter for $50 and drafted an entire book before she returned home. She had completed three more before entering one in a local contest. She won the contest, after which one of the judges, an agent, sold the rights to it and her other completed manuscripts to a New York publisher. Garlock never looked back. Garlock’s books include: Love and Cherish (1980); The Searching Hearts (1982); Glorious Dawn (1982); A Love for All Time (1983); Homeplace (1991); A Gentle Giving (1993); Tenderness (1993); Forever Victoria (1993); She Wanted Red Velvet (1996); This Loving Land (1996); More Than Memory (2001); Train from Marietta (2006); On Tall Pine Lake (2007); Will You Still Be Mine? (2007); The moon looked down (2009). Dorothy Garlock. 1982. 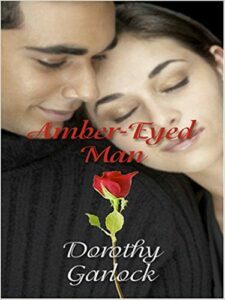 Amber-Eyed Man. Reissued in large print version by Thorndike Press in 2006. Mary T. Knibbe Sr. 1998. “An Interview with Dorothy Garlock“. Dorothy Garlock Homepage.